Brian Tracy, one of the best sales trainers in the world, says that 40% of salespeople don’t close. Jack Canfield, of mega-phenom Chicken Soup fame puts the number at 60%. As the old (and only?) song by the Monkees goes, “I’m a believer…” when it comes to JUST ASK. However, we have re-framed the ASK (CLOSE) to PRESENT THE OPPORTUNITY (to INVEST, to OWN, whatever). With that said, I am convinced more and more that it’s much more about the ‘OPEN’, not the ‘CLOSE’, that makes the SALE. Do a GREAT OPEN! It’s a VISIT, not an appointment. Talk about yourself and ask about the prospect. Then… you can move to purpose of visit. ***In our For Impact Presentation Flow, the OPEN is built around you… them… us. Amazing how many people don’t begin the VISIT talking about themselves and then the prospect before they start talking about the organization. Once you’ve made an ask (numbers on the table), the prospect status can be either pending or committed/declined. Pending implies that we’re working toward a ‘yes’ or ‘no’. The challenge is that so many requests never get to a ‘yes’ or ‘no’… they fade into pending oblivion. There comes a time when we need to force a decision. When it’s been 16 months… when you’ve made four visits… you’ll know it when you come to it. If we can’t ultimately report each request as a pending or a commit, it’s likely we didn’t really ask in the first place or we’re not doing our jobs. There is a greater danger than getting a ‘no’. It’s not having dialogue, not having any real sense of what’s working in your system, and leaving relationships in a grey – stagnant area. Tom is helping a college wrap-up a huge campaign. The five-person development team has about 70 sizeable gifts pending. Tom rallied the troops in August and said, “We’re in a phase in which there is no more pending.” For the last six weeks the team has been out having commitment conversations with each family, prospect and foundation. This has generated $14M in commitments over the last two weeks. Get numbers on the table early. Tom first said this (that I recall) at a workshop in 2001. He had developed a Sales Process for The Suddes Group several years earlier and we’ve been teaching around this sales process ever since – helping organizations build a sales teams, model and culture. At a high level this process has two components: PLAN and EXECUTION. Case for Support: Every organizations needs to know WHAT to say (the message, the story, etc). Presentation Design: And HOW to say it. Qualified Prospects: And of course SOMEBODY to say it to. Case for Support: This is not one-in-the same as a case statement. I’m fonder of the prep work that organizations usually pile into the case statement process than the actual case statement – which amounts to a long document that nobody reads. Answering the common questions for your org, your project or your campaign. Communicating the WHY (cause and case), the WHAT (again, simplifying what you do or your priorities) and the HOW you’re going to get it done which includes either a funding PLAN or funding RATIONALE. Most Case Statements spend too much time outlining the need with statistics. You’re not going to convince your best prospects of the need (the CAUSE). You’re going to sell your best on the SOLUTION (the CASE). As well, I think most case statements neglect to dive into the funding plan. One common reason campaigns don’t succeed is that top prospects aren’t convinced you have a PLAN to be successful with your overall funding goal. Our case-for-support-shorthand is around simplifying the PURPOSE (at 30,000′). The THREE funding PRIORITIES (at 14,000’) and funding PLAN (at 3′). 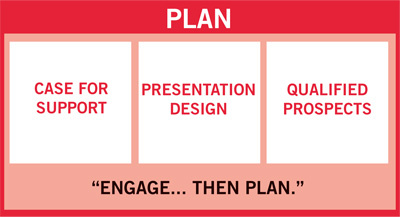 Presentation Design: It’s equally important to figure out HOW you’re going to engage people with your CASE. Not PowerPoint’s, not fancy brochures… but experiences, tours, mind-maps… The questions you’re going to ask to create engagement. In 1952 Walt Disney created a 4’x6′ storyboard illustrating Disneyland at night. This visual design was what finally secured financing for Disneyland. As he said, “Bankers don’t have any imagination, none at all.” After reading this story we’ve often DESIGNED big storyboard engagement tools to draw people into the Case for Support. Identifying prospects: The single best way is to create an IDEAL PROFILE and share this with others to generate names. Asking for prospects (without guidance) will get you nowhere. Prioritizing prospects: Build a Master Prospect List – a list of your most important prospects in descending order of importance. Work from this list. Live this list. Strategize prospects: Take the time to create a unique strategy for each prospect. Don’t ‘wing it’. Predisposition: This is not a ‘step’; it’s a mindset. Predisposition is everything you can do to make it NOT a cold call. It’s also the part of the strategy to GET the visit. Presenting the Opportunity: In the sales process most prospects can be ASKED on the first visit. With bigger prospects you might move to a two-visit strategy – discovery and then the presentation (ASK) but never 6, 7, 8,etc. visits. A good litmus test to know if there was a REAL ASK: Could you follow-up and confirm the ask…with a number… in writing? If not, was probably more of a murky exploration than a real ask. Follow-up: See my notes on How to Follow-up. This is where the money comes in. This is where most organizations drop the ball. If you can’t follow-up then you don’t need more prospects, you need to get better at following up. Follow-up with the ask, in writing. Then DRIVE The follow-up with the prospect… ball is in your court. Complete a memo-for-the-record to create institutional memory. Follow-up with yourself – be your own coach. What could you improve for next time. And so was born: THE ACTION FORCING EVENT. Every group project, whether it be a homework assignment in college or a $100M funding campaign comes down to getting a bunch of people to do something… in the case of the campaign it’s to MAKE DECISIONS… MAKE COMMITMENTS. Without some sort of a timing rationale, these decisions are never made. Similarly, homework assignments in college are never finished until the night before they’re due. On paper a request in July and a drop dead of date looks like a long time. It’s not. You’ve probably seen within your own organization requests that linger forever… years even. You can certainly close well ahead of October 15th but having this nominal ‘Action Forcing Event’ gives you a backstop… a rationale or reason to be really pushing for an answer at the end of September. The Takeaway: Include a ‘timing rationale’ in your request, or in your follow-up, that you can use as a deadline for a decision. Selling as a team – 3 important tips. Some things to think about among team members before you go on a visit. To ask for a gift to fund the vision. About the strategy above: The prospect visit was not set-up to be an ask so we needed to get permission to talk numbers. That could be permission to come back and talk about the funding plan on a next visit or, if the prospect were to say, “How can I help?” we need to be prepared to move on to objective 2 on this visit. I hope the example seems simple. The key is that we didn’t just send in a team to do ‘stewardship’. Nothing worse that a visit with no goal alignment and tons of opportunity. There can be one and only one person managing the flow of the visit. Identify that person within your team then trust in that person. 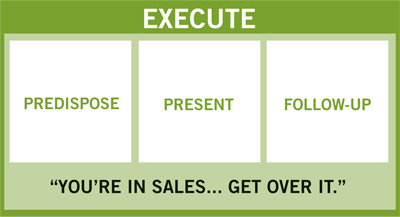 No sales call or presentation ever goes as planned. Someone is going to have to make adjustments and control tempo, altitude and flow. Trust in the leader, follow the leader. Note: I think it’s fine to change the leader in the middle of the visit – but the point is to know who is navigating. I will also review the PRESENTATION FLOW before each visit as a reminder of the general flow. We typically outline some key questions with the team as a way of forced listening. Tendency will always be to talk too much. We review some key questions as a way of coaching everyone about the importance of listening… of letting the prospect talk. For a visit we strategized on Monday. “I know you’ve often spoke of the need to increase impact in your giving. Could you talk a little bit about what that means to you now?” — Clearly the prospect was thinking strategically – asking this question not only gets the prospect sharing information, it’s also incredibly relevant. Probably some hot buttons and land mines to avoid. by Roger Martin who is a Dean at the Rotman School of Management at University of Toronto. His big thing is the DESIGN FUNNEL… going from MYSTERY (problem) to HEURISTICS (rule of thumb) and then to ALGORITHM (a system or process that works and can be replicated). Based on my 35+ years, and a ton of work in the last five years around the ALGORITHM … we have developed the For Impact ROAD MAP, which is also our SALES PROCESS. There it is. SIMPLE. STRAIGHT FORWARD. ALGORITHM (Process). You just need to EXECUTE! MAKE IT. INSPECT IT. THROW OUT THE BAD. SELL THE GOOD. The goal was to stabilize the consistency of the PROCESS to minimize and eliminate the BAD STUFF. Here’s where he went with that re: EDUCATION. The old INPUT model goes back 500 years (University of Bologna, etc.) Nothing’s changed. Same pedagogy. Teacher. Student. Classroom. If you fail, you’re gone. Throw out the bad. Keep the good. Be ‘proud‘ of the number of students you don’t accept and the number of students who don’t make it. In education, a new model of OUTCOME-BASED would look at the entire process so that everyone makes it. INPUT VS. OUTCOME. I found it really interesting and, perhaps more importantly for For Impact leaders, social entrepreneurs, change agents and Development/Sales… think about how this applies to the way we ‘RAISE MONEY’. The old INPUT-BASED model is all about activity, cultivation, marketing, annual fund, chasing mice. Writing ‘TRIPLE NET CHECKS’ to the organization from the Development Operation. A laser-like focus on RESULTS/OUTCOME… not on activities, special events, donor acquisitions, chasing mice, etc. P.S. A few days ago, a very, very senior development office, principle gift officer actually told our Vice President that the institution needed to “spend the next five years totally focused on building up ANNUAL FUND”. Can you imagine doing that in ‘business’? Let’s sell a bunch of little stuff to a lot of people… so that five years from now those people can buy more and bigger stuff. We’d be out of business. Nick has shared with you some things about an A.F.E. – an ACTION-FORCING EVENT. In the last two weeks, it hit me, again, how powerful this really is. Here are 3 quick bullets and a bonus. Priorities, Projects, Programs need DROP-DEAD DATES/DEADLINES, be they real or artificial. Draw a line in the sand. Put a stake in the ground. Use whatever other cliché you want. Just use DEADLINES as an A.F.E. !